TOP: CQUni PhD researcher Leanne Dodd and her industry colleague Pam Blamey, in Wales with the 'Storytelling for Health' program. BELOW: Participants share their stories and witnesses respond in the safety of the story circle in the Alex Reading Room, which was formerly the Swansea Central Library. CQUniversity PhD researcher Leanne Dodd is passionate about helping survivors of trauma and domestic violence who wish to share their personal stories but find discomfort in the process. Leanne says there can also be potential safety risks in exposing their abusers. However, creative writing provides "another place to stand" to revisit a traumatic history. "It is a space where experimenting, fantasising and trying out being someone else is acceptable," the Brisbane-based researcher says. 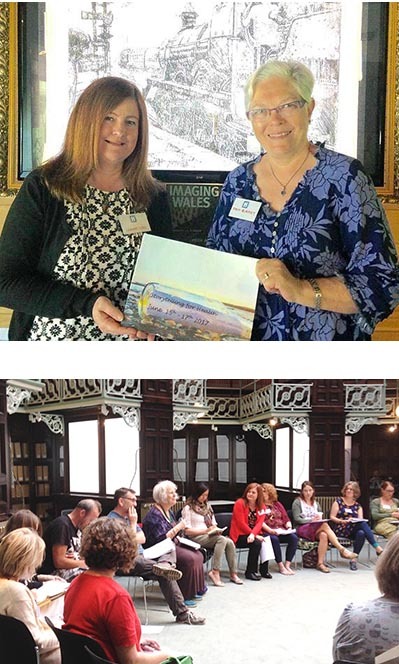 Leanne, who also writes crime fiction under the pen name of Lea Scott, recently visited Swansea in Wales to deliver a workshop to international participants at the Abertawe Bro Morgannwg University Health Board's 'Storytelling for Health' conference. Developed in collaboration with industry colleague Pam Blamey, it was one of three workshop proposals selected by conference organisers, and the only one from presenters outside of the UK. Conference convenor for the ABMU Health Board, Prue Thimbley, called the workshop "one of their biggest success stories in international collaboration". Leanne's innovative workshop employed storytelling to recognise some of the tell-tale signs of domestic violence and trauma. Applying a framework of narrative therapy, as developed by Australia’s own Michael White, it equipped participants with empowering ways to re-imagine their strengths and identity. Participants were given the opportunity to create their own fictional characters for experimenting with a new version of self. The workshop took place in the inspirational glass-domed and book-lined Alex Reading Room, which was formerly the Swansea Central Library. Participants responded positively to the experience, stating that ‘using creative writing to tell a painful story worked to share more easily with others’ and was ‘less emotionally challenging’. Many said they would recommend a similar workshop to others who had experienced trauma or domestic violence. "Participating in this international conference also gave me the opportunity to listen to, and be entertained by, talented storytellers, academics and clinicians and was vital in learning about how others are embracing writing and storytelling as a tool for improving health and wellbeing around the globe," Leanne says. This is not Leanne’s first overseas conference during her PhD candidature, having previously presented research on writing about trauma for personal transformation in New Zealand and Hungary. While overseas sharing her research, back home she was awarded a CQUni Dean’s Research Higher Degree Student Award from the School of Education and the Arts for excellence in research and significant contributions to the school’s research activities. These activities include the Narrative Health and Wellbeing Conference scheduled for CQUni Noosa campus in October, at which she is presenting another workshop. Leanne says she intends to use the award to expand the reach of her research. Leanne’s engagement also extends to community workshops and writing festivals and she serves as a mentor and Chair of the Queensland Writers Centre. Leanne is due to submit her PhD at the end of this year and has plans to develop further community workshops using writing for health and wellbeing. The CQUni researcher will soon team up with award-winning journalist and academic Trina McLellan to present a workshop on 'confronting trauma in your writing and writing life' during the Sunshine Coast Readers and Writers Festival in August. Leanne's research is supervised by Professor Donna Lee Brien and Associate Professor Sue Davis from CQUni Noosa campus.